This is very close to my favourite drawing at the moment. I did it a while ago now, and it was the first thing I drew after I got the use of my right arm back. 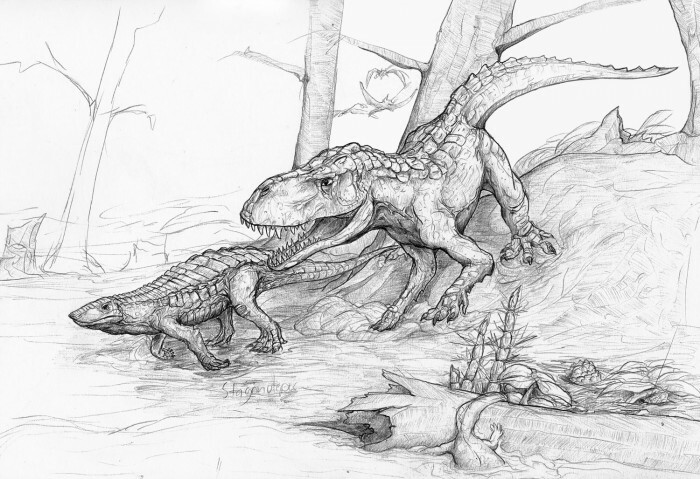 Obviously it is the Triassic, you can tell by the awesome, and features a Stagonolepis and a Postosuchus. There are also some Pterosaurs in the background, and an amphibian falling off a log, but we don’t need to worry about those. This entry was posted in Scanned Desksketch and tagged amphibian, archosaur, extinct, paleoart, triassic by Anthony. Bookmark the permalink. This is beautiful. Glad to see the love of dinosaurs has not yet died out in the world! This is actually still one of my favourite pieces. I like the Triassic, it has a very interesting range of creatures.